Google has updated their text-to-speech app with high-quality English voices and new language support today. The app now features high-definition male and female voice packs for the UK language option, as well as a high-definition female voice pack for the US language option. All 3 packs have smoother enunciation and more natural intonation than the standard speaking voices. Speaking of which, Google has also added new voice options for Brazilian Portuguese and US Spanish (in addition to Spanish Spanish). This brings the total number of supported languages to 7 (or, if you count the duplicate Spanish and English options separately, 9 language options). Actually, now that I have tried the voices I think we should count US Spanish separately; it's basically the American English voice shouting at you, with the volume controlled by speaking the word "que". Once you have the updated app (I'm still waiting), you can download the new voice packs from one of the settings menus. Look for the Language & Input option, and after you go about 3 menus deeper you'll find the download menu. You will have to sit through a sizable download to enjoy the new higher quality voice packs, however - they each take up over 200MB, while the normal quality recordings are only 6.8MB. 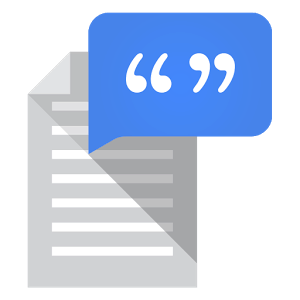 Google released text-to-speech as its app in Google Play back in October, opening the way for fast, seamless updates to this important part of the Android user experience. I believe this is the second or third update since October, and like the previous update this update should be pushed out to compatible devices automatically.